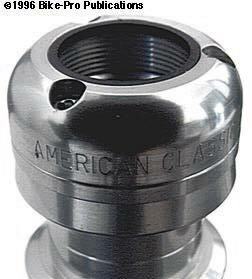 The American Classic headset is made in Canal Winchester, Ohio USA. The Trilock uses novel approach in a headset clamping mechanism, employing two pieces which are independently threaded onto the fork steer tube, and are then bolted to each other with three bolts. The locking system holds the headset pieces, frame and fork together tightly in a stable unit. The only pieces made of steel in this headset are the three tightening bolts and the sealed bearing cartridges, all the other pieces are machined from aluminum alloy rod. The fork crown, machined of aluminum, makes a stable bed for the sealed bearing cartridge to rest on. 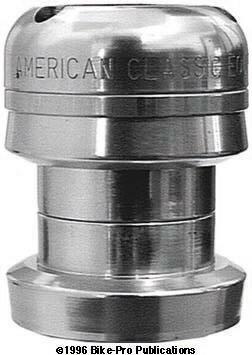 The upper and lower bearing cups are identical, machined from aluminum, to tightly accommodate the sealed bearings. The inserted part of the cup is 1.8mm thick, while the thickness of the walls holding the bearing taper to a 7/10s of a millimeter thickness. With the cone race, cups and bearings installed, the first of the two upper nut pieces are threaded into place. The lower of the two pieces acts as the upper cone race and has three holes drilled through it which are tapped with threads for the bolts from the upper piece to anchor in. The top side of this lower piece has an downward taper which nestles into a mated taper on the bottom side of the upper piece. The upper piece, with its round outer edge, has a hard rubber seal at the stem exit point. The three bolts are tiny cap screws, that have a 2.5mm hex fitting for tightening. The holes in the upper piece, (which behaves like a head lock nut) are drilled to recess the head within it. Once the upper piece is threaded into place, the bolts are tightened. The steerer to head thread contact, the bolts, and the mated tapered surfaces all work to hold the headset more rigidly than the common one piece "tighten-against-the-threads" style of locking headset. No headset wrenches are required to finally adjust this headset, and accordingly the two upper pieces have no grip points for wrench use. The Trilock is made in two sizes, anodized in four colors, Black, or Silver. The stack height of the Trilock can be adjusted to fall between 33mm and 36mm. The 1" diameter weighs just 97.5 grams complete.